Blog | IWhy specify rainscreen cladding? Modern rainscreen cladding systems provide a building with its defining aesthetic appeal. It is, however, the lightweight yet strong nature of rainscreen facades that makes them the stand out solution for building designers. It is this benefit, for instance, that allows specifiers to create buildings that appear to defy gravity, stopping people in their tracks as they pause to admire and wonder how such an affect has been achieved. It is the lightweight nature of modern rainscreen cladding systems that gives designers the ability to create buildings that inspire awe in the observer. Whether it’s a geometric projection, curved roofline or punched out apertures, it is all possible with a metal rainscreen cladding system. So many permutations of design are possible with rainscreen cladding that it is transforming our architecture cityscape. Look around any city in the UK and you immediately grasp this fact, with new designs adding interest and vibrancy to our urban surroundings. Rainscreen cladding systems such as our Secret Fix (SFS1) and Through Fix (TFS1) are manufactured off site in a quality controlled factory environment. This provides developers and contractors with several benefits the main one of which is that it ensures the cladding fits right, first time, when it is installed on site. This is because all the cladding panels are manufactured to exactly the same size and often pre-assembled in the factory to ensure that they fit on site. With thermal performance requirements getting ever more stringent, being manufactured to exacting tolerances also means that the completed building is more likely to meet the client requirements laid down at design stage. For instance, cladding panels can incorporate different thicknesses of insulation to improve energy efficiency, and the fact that this is fitted within the panels in a factory, rather than on site where inclement weather can make it far from ideal, can avoid issues with energy performance assessments once the site is handed over. Being manufactured of-site also speeds up construction because large panels are pre-assembled in the factory and then delivered to site ready for hoisting into place. These large cladding panels are then hung from an aluminium sub-frame such as our Hilti EuroFox system, and often without the need for scaffolding (installers can sometimes use mast climbers, scissor lifts or other access platforms). Exterior metal cladding is one of the most durable facade solutions available. Compared to masonry and timber, which can be susceptible to discolouration, decay or cracking, metal rainscreen is inert (will not move over time) supplied fully finished and with a manufacturer’s guarantee on its longevity. Another major benefit of rainscreen cladding is that it will not warp or twist, again like some cladding materials. That means it will stay looking good over the long term. It is a fact that where a designer likes the natural weathered-look of the facade it is possible to choose a cladding panel made from Corten. We have had a huge amount of interest in this finish over the last few months and, because of demand, have introduced a value engineered alternative in our 4mm thick aluminium composite material (ACM). This has a patterned finish to imitate a variety of natural metals, including Corten. It can be an effective way forward where budgets are constrained. Aside from the tough, long lasting, low maintenance factory finishes that gives metal rainscreen cladding its durability, the material used to make the panels is extremely robust. For example, aluminium rainscreen cladding is a popular choice because of this reason. The benefits of a rear ventilated rainscreen cavity have long been understood. It works on the principal that keeping moisture away from the building itself, and specifically the exterior substructure beneath the cladding, provides the building with known performance benefits. Rainscreen is able to do this because the gap or rear ventilated cavity between the cladding and building allows air to circulate up through this space. Any moisture or rainwater that penetrates through joints in the panel is prevented from reaching the building structure because the passage of air carries it upwards and out of the ventilated cavity at roof level. Keeping the building substrate dry avoids issues with excessive energy loss, damp and corrosion of individual components. The profusion of materials and finishes now available means that whatever design concept you envisage there will be a rainscreen system available to help you deliver it. New finishes added in recent years include Corten, stainless steel, Formica, solid laminate and a vast range of other exiting options. Perforated cladding panels remain an enduring choice, too, as they look great and can be used as a brise soleil or screening. Plus a reputable manufacturer will be able to supply a full range of matching accessories including roofline, window reveals, soffits, fascia and column casings, plus others. 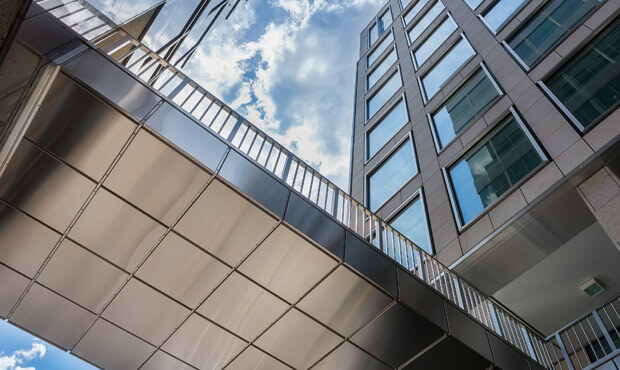 Metal rainscreen cladding has been a popular choice on commercial buildings for many years although more recently interest from the residential sector has soared. Many architects and developers prefer to use it because it gives them more choice in making their designs distinctly different. The ability to create architectural façades that stop people in their tracks is one of the reasons why we have had so much interested in our metal rainscreen cladding systems over the last 12 months.